Kelly's Korner: Why Can't My Mailbox be Like this Year Round? Why Can't My Mailbox be Like this Year Round? I'm sure you are wondering and I'll just tell you - NO - I do not have a Christmas outfit for every day of December - but it's close. Almost all of her outfits were gifts and several like the one she is wearing today belonged to a sweet little girl named Alexee. She is a year older than Harper and her mom, Jamie, let me borrow several things for this season. And I'm loving them!!! We just don't have enough places to wear all of our cute things. Today we went to Target and ran a few other errands. It was good to get out but it was so cold. Running around with a baby in the winter is not as fun or as easy as the summer. Having to keep them bundled up and trying to fit that in the car seat is a mess. But we still enjoy a few outings! I thought I would share our Christmas card with you now that I have sent them out. I love it SOOOO much! This is the front! In case you can't read the verse at the top - it says "He has done great things for us and we are filled with Joy" Psalm 126:3. I can't think of a verse that better describes this past year for our family. And this is the back. This sweet and beautiful girl came to visit us in the hospital in Tulsa and she made Harper the most amazing note cards. I still haven't used them and I don't know if I will ever be able to. She is just precious and I was so thankful to have her make our cards. She is also an amazing photographer. You can check her out at www.amy-dale.com. And she is pregnant and I'm so happy for her! 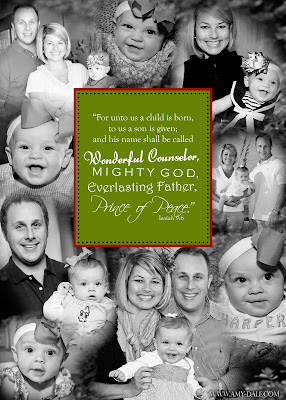 One of my first sweet blog friends, Faith, is hosting a Christmas Card Carousel on Tuesday. I'm going to be linking up to share my card and you should too! Christmas cards are my ABSOLUTE favorite thing about Christmas. I seriously run to the mailbox every day and I love opening all the cards and seeing all of my friends. I save all the cards I get in a photo album year after year. I love to look back and see how families have changed and grown. I love all the technology we have and the e-mail, blogs, facebook and twitter but there is nothing I love as much as good old fashioned snail mail. I just wish my mailbox was as fun to open all year as it is in December. P.S. If I had all the money in the world - I would send a Christmas card to every one of you who read my blog! I can't thank you enough for all the kind comments, prayers, suggestions, advice and ideas that you give me! So pretend this is in your mailbox from me to you. (Cause even if I had all the money in the world - I would not spend it on Christmas cards and stamps - I would support every single Compassion child that needed a sponsor and give Christmas gifts to every single child in the world who won't get any). I love that sweet little girl's smile!! I know you're just loving enjoying her first Christmas!! And that Christmas card is precious!!! Too cute!! i agree 100%! i LOVE getting and sending Christmas cards! it's a highlight of my year! harper is cute as always! I LOVE your card. I have never seen one like that with all the pictures. I just love love love it! Merry Christmas. Love love love your Christmas card! I love Christmas Cards too...and you'll be glad you started the photo album... I did the very same thing over 20 years ago. It has relatives, high school friends, college friends and their families. It is fun to watch the children grow up right before our eyes! Kelly- the cards are beautiful! Christmas is such a wonderful time to reflect on our blessings!! Aren't you too sweet! Thanks a lot for the "virtual" Christmas card. I'm a reader who doesn't comment very often but just know that you are a very special person! ooooo! i just LOVE your Christmas card! December is the only month i run to the mailbox too....I wish we got cards all year round. I found you on the other blog through the giveaway and popped over here. My husband and I both are born and bred Arkansans (Mountain Home) and went to OBU, but we're older than you! We have miracle twins that just had their 16th birtdays last week, so your daughter touched a special place in my heart. Enjoyed my visit here! lovely... lovely... love coming to your blog. That is the greatest Christmas card ever! Patsy Aiken Outfit!! They make those clothes in Raleigh where I live and they have AWESOME sales all the time in there warehouse. A girl at playgroup had that exact outfit on today! Love your card! That is beautiful. What a beautiful Christmas card. Thanks so much for sharing. Beautiful card! Your verse made me cry. Harper has brought me joy too and I am so thankful for her and Evie. Can't believe they are almost 1. AHHHHH! I so agree with you...Christmas cards are one of the BEST things about this season. I love them, too! I love you card. I always have such a hard time picking out just the right card. I too love Christmas cards. such a beautiful and creative card! You are such a beautiful family! Love all of Harpers outfits! i love your card! and i love getting christmas cards in the mail too! i finally just ordered mine yesterday, so we'll be a little late this year....better late than never! Love, love, love the card. Did you make it yourself? If not, where on earth can you get a double-sided photo card? I would love one for next year. Harper as always is just precious!! I'm not addicted to making ornaments. I've been to Hobby Lobby three days in a row now getting different ribbons, etc. I gave one to a co-worker as a birthday gift and she just loved it. Another co-worker who gushed ovre it is also getting one for her birthday next week. Completely darling card. Thanks so much for sharing it. Psalm 126 is "my" psalm. I agree--Christmas cards are so much fun!!! I love going to the mailbox in December! Your card is ADORABLE!!! It was so fun to open the page and see H in A's little Christmas dress! :) She looks so sweet--I love that dress! I'm happy she's able to wear them this year! We just got home and I told Howie to stop and let me get the mail...LOVE, LOVE, LOVE getting Christmas cards!!! I used Psalm 126:3 on our card this year too. He has done GREAT things for both of us!!! What an awesome card!!! Thanks for sharing and Merry Christmas to you too! Such a cute Christmas card! There are so many cute pics of Harper to choose from I'm guessing she had her work cut out for her! Beautiful card Kelly. Thanks for sharing. I agree- a good old fashioned snail mail card cannot be beat! 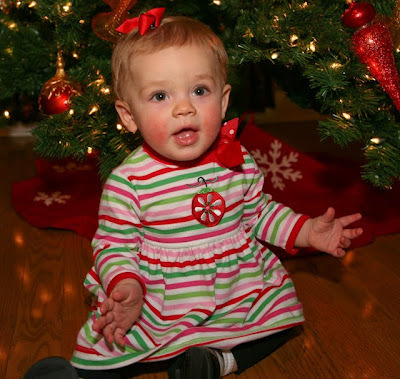 Why can't I get my 10 month old to sit still in front of the Christmas tree like Harper?? Go Harper! Beautiful Christmas card. The back is my favorite! I love the "non-traditional" but totally appropriate verse you used, too. I totally agree with you, I love getting all the cards in the mail! Everyday when I get home from work I feel like I am giddy while walking to the mailbox, I just can't wait to see what's inside. In fact, I am even excited to get Christmas cards at work, ha! I absolutely LOVE this time of year! I just love your Christmas Card! It is so cute, and so is your sweet daughter. Enjoy every minute! I know you do. Merry Christmas! I love your family Christmas Card! Those are also really great pictures of Harper! The cards are perfect!!! I love how she used the back of the card as well. I totally agree about how fun "snail mail" is (especially when it is December)! Oh, Kelly, I love your Christmas card! It's just beautiful! Poor Dawson - didn't make the Christmas card this year. But the center top pic of Harper in the smocked dress is my favorite. What a cutie! I love your ideas for your card. This is one everyone on your list will surely keep. It might even go on their frig!HA. 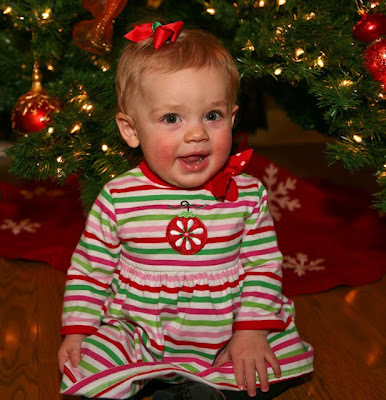 Harper is adorable in all her Christmas outfits.Keep Warm! I used the exact same verse on my cards I just printed yesterday! I love it so much and agree- it is perfect for you (and for our family, too). Harper is adorable and I love reading about her. I have a little boy so I get my "girl" fix from your blog! Ha! Does Harper have a Christmas outfit for everyday in December? I have never seen so many cute Christmas outfits. Christmas cards in the mail. Your Chrismtas card is beautiful! all the pictures is so nice! I adore cards too! Just about to write some more! Love your Christmas card...too CUTE!! :) Have a great weekend! That is precious & I love the colors & style of the front! Christmas Blessings to your family!! And all year through! 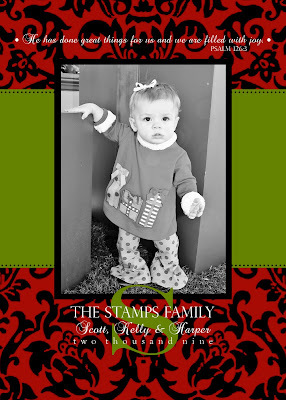 Love the Christmas card...and Harper always looks so cute in her adorable outfits! I completely relate when you say how hard it is to run errands, etc with a baby in the winter! I plan on getting a car seat poncho from http://www.carseatponcho.com/ in a few days. There's even a girly poncho you can buy from there that $3 of the money will go to the Kyle David Miller Foundation. It looks so much easier to use than a regular coat and the baby still stays SAFE warm. This is especially important since we aren't supposed to keep them in bulky coats while in a carseat (the coat compresses in the event of an accident and the child can come out of the seat). I love your Christmas card and I'm with you about the cards...I love getting the mail in December for that very reason. I also save the cards but we put them in a basket by our dinner table and each night when we sit down for our meal before we eat my son picks a card and we pray for that family when we say grace. We want him to learn the importance of praying for others. I pray your family has a blessed Christmas and a Happy New Year. Your a blessing to me each time I read your blog and that is almost daily. Thanks and keep it up!!!! I would really miss you if you didn't blog!! I look forward to 2010! No Dawson? I love cards too and need to keep at getting mine ready. So sad there is not one single picture of Dawson in your Christmas card, unlike last year. He definitely has taken the back seat! Poor thing! You are such a sweet person. You have made such a difference in my life. Thank you for being the inspiration I so desperately needed when I gave birth 12 weeks ago. You have an impact on people's lives that you don't even know about. Thank you for being you. Thank you for the "Christmas Card"! I love it! It's adorable! I run to check the mail everyday, too! Got your card today and it is precious as always! I love that we are families of three this year (with the doggies, of course)! I'm a little embarrassed...I got your Christmas card a few days ago but I didn't even realize it had pictures on the back!!!!! I'm so glad you posted this. Jaiden loves looking at them too! :) We can't wait to get to the mailbox after school to check for cards! That verse is so fitting for my past year as well. And I thought it was fitting for ya'll, even before I read what you said. What a pretty card! I need to get on top of things and get ours out, we didn't do photo cards, but I think we might next year. I'm thinking something Hawaiian and pretty and beachy, since we live there now. Our cards to say Merry Christmas in Hawaiian! I just love reading your blog and you are such an inspiration to me on so many levels! Thank you! I just love Christmas Card! Your family is beautiful! You are such a wonderful person and I am so glad to have you for a blog friend... maybe one day we can meet in person.. I would to see Harper too! I can remember when my 6 year old daughter was her age.. I miss it so much but i am loving her age now too! Treasure each moment because time goes by way too fast for me! Have a wonderful and Merry Christmas! Your Christmas cards are beautiful. We used the same verse on our cards this year, isn't it so perfect for so many different situations?!?! Thanks so much for sharing your Christmas cards. I so agree with you when you say you love e-mail and facebook, but that nothing beats going to get the mail this time of year! I also do the same and keep the pictures from year to year in a photo album thinking years down the road I will be amazed at how little the kids were and how much they've changed. Have a blessed, fun Christmas because as I'm sure many people tell you, the kids grow up so fast (mine are 12, 9 & 5)! LOVE your card! How original! I love how you have so many pictures on it and incorporated the verses. I love Christmas picture cards too! I'm always sad when people send a card without a picture! I put all of the pics on the fridge! love it! Love your Christmas Card!!! My husband and I are always so excited to cards too in the mail! Merry Christmas to your family! WIthout a doubt, that is one of the cutest Christmas cards that I've ever seen. I love that bible verse, very appropriate for you and your sweet family!